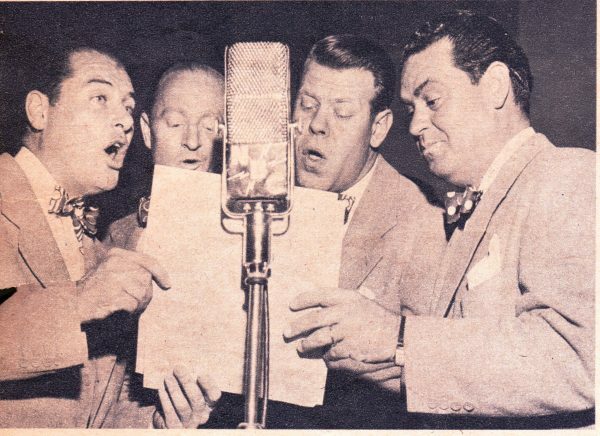 Jack Benny, pictured at the microphone, spoke softly and carried a big shtick.Photo courtesy of the author. Born Benjamin Kubelsky in Chicago, on Valentine’s Day, 1894, Benny was the son of Polish-Lithuanian immigrant parents who dreamed that their child would become a concert violinist. Benny had other ideas. After launching his entertainment career at 16 as a fiddler in a silent movie theater’s pit orchestra, a brief stint in the Navy exposed him to the pleasures of telling jokes to reap laughter from his audiences. Adjusting his stage name several times to avoid duplication with famous violinist Jan Kubelik and comedian and bandleader Ben Bernie, newly-rechristened Jack Benny toured U.S. vaudeville theaters throughout the 1920s, honing his skills as a quiet, suavely dressed, jovial monologist and master of ceremonies, who quipped about the frustrations of urban life and the foibles of his girlfriend, while holding either a cigar he did not smoke, or a violin that he did not play. Each year, Benny perfected one 15-minute routine and performed it at the various theaters from Boston to Los Angeles that he visited for weekly engagements. In May 1932, with vaudeville in a death spiral due to the Great Depression, Benny turned to the growing entertainment medium of broadcast radio. It was Benny’s understanding of radio’s unique challenges—and his ingenious solutions to them—that helped him become the number one comedian in radio history, forging a template that many imitators and competitors would follow. The NBC network organized a twice-weekly program, sponsored by Canada Dry Ginger Ale, of popular music performed by George Olsen’s orchestra, accompanied by Ziegfeld Follies chanteuse Ethel Shutta (Olsen’s wife). Benny would fill the interludes between songs with his humor. In those worst of economic times, inexpensive radio entertainment (free, once the receiver was purchased) was becoming phenomenally popular. From crooners like Bing Crosby, to comics like Eddie Cantor and Gracie Allen, to President Franklin Roosevelt, newscasters, and Amos ‘n Andy, performers’ voices wafted into American homes and became hugely influential in popular culture over the next two decades. This opportunity, however, came with challenges. Now Benny had to produce two 30-minute segments of brand-new material every week. In a panic, he pulled orchestra leader Olsen over to the microphone and started trading conversational quips. The announcer was also incorporated, with Jack informing the unseen audience that Ed Thorgerson’s thin mustache made him look like he’d swallowed all of Mickey Mouse but the tail. After his third appearance exhausted his old file of vaudeville lines, Benny hired vaudevillian Harry Conn as his writer, and the two set out to create humor through the characters of the show’s personnel, and comedy through the interaction of those characters he’d found in the broadcast booth. Together they devised a number of comic stratagems—many of which still exist today in one form or another. Benny recognized that radio, at its best, was a deeply personal, one-to-one medium. Rule No. 1 was, don’t just rattle off a litany of old jokes. Instead, create conversations between speakers on the show, at least some of whom are continuing participants—essentially they invented one of the first workplace situation comedies. In each episode, Benny, band leader, singer, announcer, and part-time secretary Mary Livingstone (Jack’s offstage wife) poked fun at each other’s foibles at the radio station. When not fulfilling their purported duties, they joined Jack in studio adventures (enacting movie parodies and murder mysteries and kidding the sponsor’s product). Other times their adventures occurred at Benny’s house (staffed beginning in 1938 by Eddie Anderson portraying Rochester, Jack’s impertinent valet) or out on the streets of Hollywood. Second, let your speakers’ unique personalities and voices shine through as individual, quirky characters. Listeners will get to know them, and you, and your group will build collaborative relationships. Jack Benny’s radio character suffered all the indignities of the powerless patriarch in modern society—fractious workplace family, battles with obnoxious sales clerks, guff from his butler, the withering disrespect of his sponsor, every woman he met, and Hollywood society. And yet he was a lovable schlemiel. Jack Benny was the Jerry Seinfeld, Larry Sanders, or Liz Lemon of his day. Benny also knew that silence could be as funny as snappy punch lines. A master of comic timing, he was able to take scripted dialogue and polish it until it sounded unscripted and yet did not contain an unnecessary word. A superb director in the broadcast studio, Benny was also able to guide his cast members and guests on when to take a breath, how quickly to respond to a line. In the case of his off-mike “wife,” Mary Livingstone, queen of the insult, Benny had her wait out of the range of a group conversation where Jack was bragging, and then leap out of the invisible ether to deliver a devastating retort or a “shut up” that brought down the house. Benny, was also a canny creator of advertising messages and a powerful media production executive. He battled with sponsors to gain greater creative control of his program, and famously integrated sponsors’ products into his comedy, from conservative Canada Dry in 1932, to Jell-O (too successful, eventually forcing the sponsor to end it), to Lucky Strike in 1944. Benny brilliantly sent up his sponsors’ products with ironically humorous commercials that turned the commodities into absurdities and soothed the incursions of consumer culture into listeners’ everyday lives. In an ingenious addition in 1946, Benny brought in the zany comedic singers of the Sportsmen Quartet to perform ridiculous musical versions of the widely-criticized, blaring Luckies commercials that the sponsor insisted must open and close the program. The Sportsmen’s parodies of popular songs merged the yawping of the tobacco auctioneer with operatic classics, the Anvil Chorus, and “Deep in the Heart of Texas,” while Benny vainly yelled at them to stop. The Sportsmen Quartet sang parodies of popular songs that turned into delightfully nonsensical Lucky Strike commercials. Photo courtesy of the author. Crucially, Benny understood that an aural medium needs to tickle the listener’s ear with humor that’s meant to be heard, rather than seen. Mel Blanc became one of the most beloved performers on Jack Benny’s radio show, not only for his characters like Professor LeBlanc—the humiliated and bedraggled violin teacher who suffered through Jack’s lessons—but also for creating the sounds of Jack’s ancient Maxwell jalopy and the animal growls of the guardians of Jack’s subterranean money vault, where in miserly manner he squirreled away his fortune. In fact, Benny was quite leery of ever entering television, for he knew how much his fans loved not the idea of the rattletrap automobile, but the sounds of Mel Blanc doing vocal gymnastics to bring the Maxwell’s sputtering engine to life. Benny also realized how to take advantage of unexpected on-air developments or mistakes. In the early 1950s, when he’d already been on the air for nearly 20 years, Jack’s reactions to verbal mistakes, miscues, and on-air goof-ups took on a life of their own. Mary, in particular, started messing up lines, turning “swiss cheese sandwich” into “chiss sweeze.” Benny’s instantaneous eruptions of wisecracks and retorts when mistakes happened were shockingly delightful to hear. A caveat: Jack Benny, his writers, and the cast created their humor more than a half-century ago, a time when cultural norms accepted vast amounts of racism, sexism, homophobia, and xenophobia. Benny’s radio humor was a product of its time and place and should be subject to critical examination. But despite their failings and omissions, Benny and his writers sometimes could show a flexible acceptance of social and cultural difference, creating a space to disrupt these widely held attitudes toward race and gender, taking the side of the marginalized. The character of Jack’s African-American valet and butler, Rochester, was central to the construction of race on American radio. Made “safe” for white audiences to enjoy because of his servant role, Anderson as Rochester entered millions of homes every week. Although Rochester was an intelligent, sassy butler, Benny’s writers often saddled the character with racist stereotypes, enabling many radio reviewers to describe him as shiftless, superstitious, and content with low pay and a tyrannical boss. The radio show was obsessed with making references to his black skin, emphasizing his difference, yet uniqueness. Many black Americans struggled with Anderson’s identity as a famous radio celebrity—alternately repelled by the stereotypes, but proud to see an African American become so prominent in mainstream white network radio. Eddie Anderson as Rochester found himself caught in the middle—between widespread success, then racist backlash from conservative whites on the one hand, and disdain from black liberal critics on the other. After ruling radio comedy for more than 20 years, in the 1950s Benny transitioned to live TV broadcasts. There was initial discomfort, but soon Benny learned to emphasize his long, silent, pained glances pointed toward the TV cameras to communicate humiliation and humor to audiences in American living rooms. Then he was acknowledged as one of TV’s greatest stars. He ended the radio program in 1955 and remained a top TV performer on his sitcom for a further decade, and on TV specials until his death in late 1974. He had invented a quintessentially American art character: the genially self-deprecating fall guy. Kathryn H. Fuller-Seeley is William P. Hobby Centennial Professor of Media History in the Department of Radio-Television-Film at the University of Texas at Austin. She is the author of Jack Benny and the Golden Age of American Radio Comedy (University of California Press).